This picture was taken the day I graduated from college. 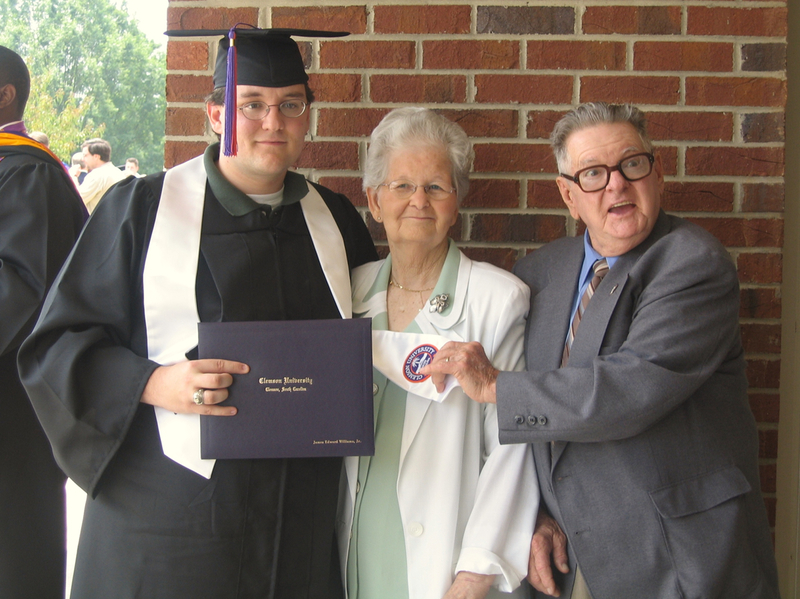 With me are my grandparents, who made the fairly arduous drive so they could be there to see it. To me, my college graduation was a boring chore that I couldn’t find a way to get out of. But to them, it was worthwhile enough to go a fair bit of trouble to be there. When I look at this photo, my eyes can’t help but be drawn to my grandfather. He’s wearing an expression on his face that assures me that the camera caught him in the middle of one of the millions of little jokes and jests he’s told. It’s likely he was riffing on my university of choice. And you can tell by the look in his eyes that he wouldn’t have missed that day for the world. Throughout my life, my grandfather has always been the voice of quiet strength tempered with laughter. He was the expert: the expert gardener, the expert woodcrafter, the expert quilter, and (if 60 years of marriage is any indication), the expert husband. He was the patriot who served in the Air Force during war time and he was the grandfather who took me to the aviation museum when I was a kid. As one of only two grandkids, I had the supreme privilege of being spoiled rotten by him. Because we always lived a long way away from them, I didn’t get to see him very much. But his visits were always sure to be filled with toys and big bags of candy. Even as an adult where the “bribes” weren’t quite so blatant, I’ve never been sad to see him. He’s always just been joy personified. You’ve probably never met him, and I wouldn’t blame you for considering that one of your life’s greatest regrets. In recent years, age has caught up with him. He has suffered multiple strokes. His wit has faded as his mind has slowed. In my most recent visits with him, he was usually more likely to be dozing in his chair than anything else. But he was always happy to see me: and I’ve always been overjoyed to see him. My grandfather passed away today. His illnesses and age finally overcame his vivacious will. Other than his jokes, he was a quiet man. So I didn’t talk to him as much as I should have. I don’t know many details of his life. I know that he was in the Air Force. I know he retired from Blue Bird, building school busses. I know that he had the most skilled hands I’ve ever seen: over the course of his life, he made the most amazing wooden toys I’ve ever come across. That’s when he wasn’t gardening and growing giant tomatoes. And that was when he wasn’t and quilting making some of the most treasured things I own. 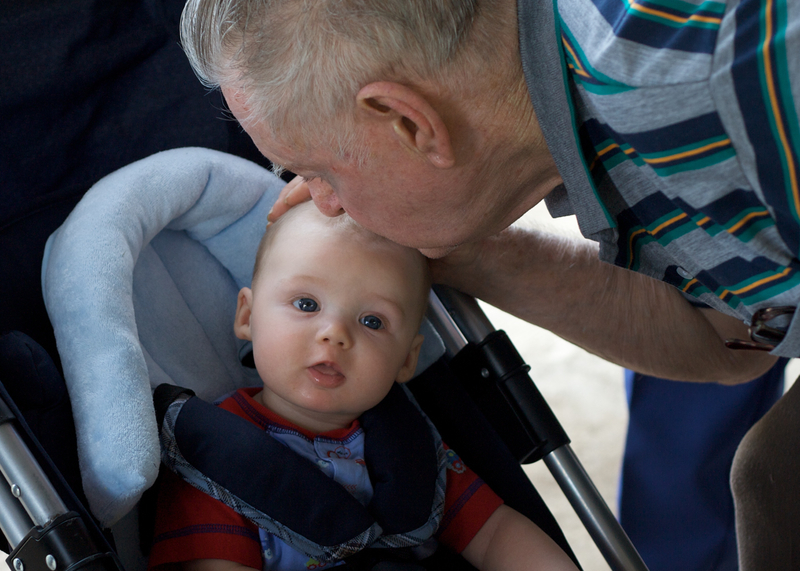 I know that his friends call him “Bill”, my father call him “dad”, and I call him “Paw Paw”. And I know my own dad. I know the man he raised and the values he worked to instill in his children. As legacies go, I assure you that that beats all. So while I didn’t hear many of my grandfather’s stories (and that’s going to be an ache in my heart for the rest of my life), I think I know him pretty well. I don’t think it’s possible to not. And since I knew my grandfather so well, I can choose to remember the good times. Even though my time with him over the last several years have been dominated by his frail body forcing comparisons to the proud man he used to me, I can choose to remember him as he was when I graduated from college: full of life and energy, a constant stream of mirth, and proud as all get out of his family. In so doing, I hope that maybe I can do some sort of justice to the memory of this great man who I loved dearly. I’ll miss you, Paw Paw. [Warning: Contains minor spoilers!] I was one of the lucky ones: it took me couple of years to hear about Patrick Rothfuss’ The Name of the Wind. So when I finally read it (and it became one of my favorite books), I only had about a year to wait for the sequel. Even then, though, it was a long wait. I found Mr Rothfuss’s blog and quivered and exulted over every writing update he made. I’m sure my spouse-type-person quickly tired of my celebrations as the release date crawled closer. And, of course, I rearranged my schedule around March 1st to maximize my available reading time. I relate all this so you can understand: when I say I was excited about this book, I’m speaking with a great deal of restraint. And I could not have had higher expectations for it if Tolkien himself had risen from the grave to "tell one or two more stories about Hobbits". This is the context in which I read this book. And it did not disappoint. Despite life getting in the way and my employer expecting me to work every day, I finished the book far faster than I expected. It was tough to put down. And the night after finishing it, I was stuck awake musing over Kvothe and his life and adventures. Which I think is the mark of a good tale. If you read the first book, you know what to expect from the sequel. It’s a tale of a brash young man of great ability combined with poor decision making skills. So he gets into troubles and then gets out again (often by stepping into an even greater pile of trouble). And there’s magic and wonder and music and all of the things the first book taught us to love about Kvothe’s adventures. Frankly, there’s not much there to not like. Indeed, all of the negatives about Wise Man’s Fear are because it finds itself in the awkward position of being the middle book of a planned trilogy. So, as is normal for a middle book, it finds itself flopping about a bit. The main driver of the first book was Kvothe trying to get into and (and then stay in) the University. The second starts with him as a University student…and ends with him as a University student. The first book was about Kvothe learning to call the name of the wind. The second starts with him learning to call the name of the wind and…end with him learning to call the name of the wind. Sure, he’s a little better at it: but he still hasn’t finished that part of his quest. And so the book kind of feels like a large amount of work for Kvothe to end where he started. That’s not entirely fair, of course. The Kvothe at the end of the book has done and seen far more things than when he started. One could even argue that he had managed to gain a little bit of wisdom. And while that may be true, he doesn’t strike me as any more or less of a hero than he did in The Name of the WInd. His character develops, but it feels like it happens to a much smaller degree than a thousand page book necessarily warrants. It also starts to be concerning that he’s still a University student by the end of the second book. The framing story of an older Kvothe telling the story of the novel sets up what is (for me, at least) the driving question of the tale: what happened to turn the young Kvothe of the main story into the older, slightly broken, Kvothe of the framing story? That’s what I want to know. One of the few clues we have is that he was expelled while still being very young. Since he’s still in the University at the end of this book, that means the last book will need to squeeze in a ton of adventure to get from A to Z. I don’t doubt that Rothfuss can do it (so far, he strikes me as a masterful storyteller) if he chooses. But I’m starting to be worried that the story I’m interested in is not the one he wants to tell. But those things happen, and it is his sandbox. As negatives go, though, that’s pretty slight. "The author did not tell the story I wished him to tell." It’s hard to take that criticism too seriously. And you shouldn’t. This is a wonderful book. The writing is easily some of the best in the genre today and it could probably rival all of contemporary literature. Rothfuss has some truly brilliant phrasings and quotes with a couple of my favorites being, "Books are a poor substitute for female companionship, but they are easier to find." and "Hespe’s mouth went firm. She didn’t scowl exactly, but it looked like she was getting all the pieces of a scowl together in one place, just in case she needed them in a hurry." I ask you: how can you not like writing like that? Though this is a carryover from the previous book, I also still like the world. I like that magic behaves like physics: energy is conserved and you can’t get anything for free. I like some of the rules and fouffery of the upper classes (I particularly like all of the rings in Severen). I like the way the bigotry feels real and organic and awful (and not just tacked on to make a point about how modern the author is). Rothfuss has put a great deal of care in to his world, and he deserves credit for it. Ultimately, if you like the first book, you really have no choice: you have to read this one. If you didn’t like the first book, you have absolutely no reason to read this at all (you also have absolutely no taste: but that’s another matter). If you haven’t read the first book, there’s no point in starting this one first; but I heartily recommend you pick up The Name of the Wind as you’ll be doing yourself a huge favor. On a 5-point scale, I’m forced to rate this one a little lower than its predecessor; but that’s entirely because of the problems it has with being the middle book of the trilogy. I’m already anxiously looking forward to the next book and mentally preparing myself for what promises to be an increasingly long wait. I also wouldn’t complain if Mr. Rothfuss decided to extend the story beyond three books. I think Kvothe could handle it and I suspect I won’t easily tire of reading about him.